Live Girls! Theater and Raisins present Raisins in a Glass of Milk 2019 a bold new theatrical experience about the power of representation. Live Girls! Theater joins forces with the creators of Raisins in a Glass of Milk to create an all new play. 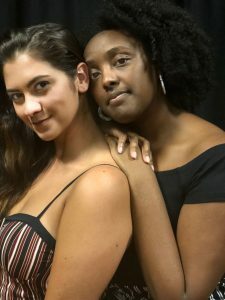 Seattle actors, directors, and teaching artists Lexi Chipman and Maya Burton are continuing their work by sharing stories of theater makers of color from across the country, deconstructing the ways in which white supremacy operates in the theater. They first developed Raisins while attending Cornish College of the Arts. Raisins was restaged for Cornish Presents, the college’s visiting and professional artists series in the summer of 2016. 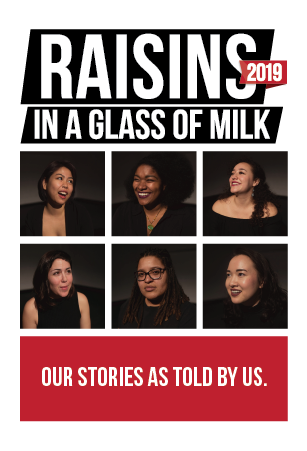 That was followed by a successful production at 18th and Union in February of 2017 where The Seattle Weekly praised the performances as “deeply humanizing and poetic.” Raisins in a Glass of Milk 2019 is a new show, crafted from new stories, tackling the same issues. With an empowered all female cast and directed by Maya Burton and Lexi Chipman, Raisins 2019 puts the fight for inclusion and representation centerstage. Raisins in a Glass of Milk 2019 is the first in an annual series simply known as Raisins. This production will be the first of many where The Raisins Team will continue their mission conducting new interviews weaving them into an original play to be produced every February. Raisins 2019 was generated from 250 pages of candid interviews from artists of color from around the country and was crafted into six multidimensional women with six different backgrounds and six distinct points of view. These women of color will be confronted with the question: “How can we dismantle white supremacy in the American theater?” In trying to find the answer they will walk to the edge of what is civil to find what is right. Live Girls! (LG!) Theater is proud to team up with creators Lexi Chipman and Maya Burton. This unique partnership is the first of its kind as the co-creators have joined the company as producing partners to bring this project to the stage in February 2019.